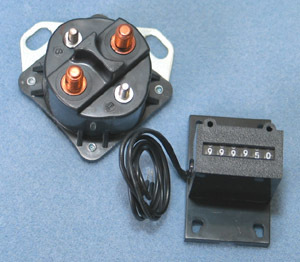 Solenoid "Odometer" For Sailplane Use - INJOY LURE COURSING EQUIPMENT....When you want the best, buy INJOY! We like to think of the counter as an odometer for the solenoid and motor on your lure machine. It is in fact a mechanical counter that is connected to the solenoid and it counts the number of times that the solenoid is activated...each time you hit the button, it flips over one number. We can just imagine the "so whats" coming from the people reading this...so we'll explain the reason that this is important. The INJOY solenoids are rated at 60,000 actuations (expected life), soooo, when you get to around a 50,000 count, you can change the solenoid and avoid a breakdown or locked solenoid at your field trial. This is called preventive maintenance orrrr, you can go for the "solenoid actuation world record" and wait for the solenoid to fail before replacing...it's your choice. Another condition that can happen, with a solenoid near the end of its useful life, is that the motor will start heating up prematurely because of the resistance caused by the worn electrical contacts in the solenoid. Also, the brushes in the motor last around +/- 120,000 solenoid actuations. The counter is easy to install. There are two wires...one wire needs to be connected to a ground...the mounting bolts for the solenoid on the lure machine works good or the mounting bolts for the motor. The second wire needs to be connected to the small (#10) terminal on the solenoid...the same terminal to which the switch is connected. It does not matter which wire is connected to the ground or the #10 solenoid terminal. The counter shown with a solenoid for size comparison.